I am very excited about embarking on clinical use of exosomes within the context of physician-patient relationship as I discussed in this recent blog. This video is mostly audio from the lecture that I attended in December of 2018 and that the physician next to me remarked was “the best lecture I’ve heard in over twenty years of coming”. It features Duncan Ross, Doug Spiel, Shelley Jordan, Ian Whyte, AJ Farshchian. I was happy to meet Dr. Duncan Ross and then to have a very nice dinner with him and his team later that night. In this 55-minute video, I will break it down because it is a bit like listening to old time radio given paucity of video and you may need some help to bookmark certain highlights. At 10 minutes, Dr. Klatz asks a question which a prompts a statement from Dr. Ross that the latter believes and anti-aging exosome will someday cure aging. At 12:00, Dr. Sheldon Jordan, a sixty-something year-old clinical and research neurologist from Southern California enters. He was the other “walking wounded” doc. He starts by making an astonishing statement that Parkinson’s, Alzheimer’s, and nerve injuries are reversible. He has used exosomes in 50-100 patients in Alzheimer’s and Parkinson’s, nerve injuries, and refractory depression. Jordan describes his near-fatal motorcycle accident 4 wks prior resulting in a loss of a third of his blood, compound fracture of his clavicle, 11 rib fractures, a lacerated liver, kidney, and adrenal gland, fracture/dislocation of his ankle resulting it “hanging like loose skin”. He endured 6 hours of surgery and a week-long inpatient stay. 3 days after surgery he gave himself 25 billion exosomes intravenously, presumably without the knowledge of the medical staff. He stated that after two weeks, the pain was gone from his rib fractures. He further alleges that the current x-rays don’t even show a fracture line in his ankle! Dr. Ian Whyte of IMAC Regeneration Centers enters at 17 minutes and the video kicks in around 18 minutes. His experience is mainly with stem cells but he has used exosomes in under 100 patients. He presented the resolution of spasticity and some regaining of control in a case of paralysis after stroke in only 24 hours and some significant recover within four days. He states no adverse responses in his clinical experience which is mainly stem cell based. Dr. Klatz states that the regenerative therapies are inherently safe. Dr. Ross reiterates NO ADVERSE events despite tens of thousands of clinical uses. At 24 minutes, Dr. AJ Farshchian, the director of The Center for Regenerative Medicine enters to promote his blindness initiative and discuss the extraction of umbilical cord stem cells. He shows an intranasal injection. At 30:30, Dr. Doug Spiel is introduced. He is the interventional pain/radiologist with the most clinical experience with exosomes who describes hearing Duncan Ross in 2016 and then joining the Kimera team as the Chief Medical Officer. He describes a case of Chico, a severe quadriplegic for seven years, who received exosome therapy. 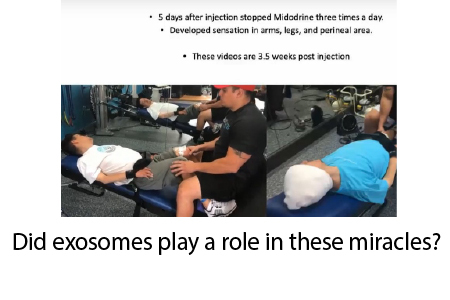 Within five days of his first and only treatment, his midodrine therapy stopped, he started developing sensation, and within 3.5 wks, he was recovering weight bearing in his legs. Dr. Speil explains his belief that inflammation is the cause of heart disease, atherosclerosis, and even cancer. He discusses the signaling proteins found in the Kimera MSC exosomes and how they work to decrease inflammation AND promote mitochondrial function. He claims that with his Type I insulin-dependent diabetics require 60% less insulin within one week of exosome therapy. At 39 minutes, Dr. Shelly Jordan returns to discuss his 30 Alzheimer’s/Parkinson’s patients being treated with exosomes who show improvement within three months. He doesn’t state what percentages are improved. At 41 minutes, Dr. Whyte is asked by Dr. Klatz to estimate his response rates. He evasively estimates that significant responses occur in nearly everyone and very dramatic effects in many. His experience with MSC allogeneic (not self) cell therapy showed that the pathology tended to recur after months. With expanded autologous (from the patient’s own cells, multiplied in vitro), the recovery was higher at 80% but the patient’s illness phenotype would recur. With exosome therapy, the response rate was more like 90-95%. At 44 minutes, Dr. Jordon brings up the great point that using exosomes and stem cells from neurologically damaged people is not logically sound because of perpetuation of prion disease and the general conditions of disease that are established already. At 45 minutes, Dr. Spiel chimes in to make an important point about the lessons of parabiosis. When you sew an old and young animal together, there is a benefit to old animals and a detriment to young animals. He explains that the old mouse’s cells are producing a SASP (senescence associated secretory phenotype) and that aging is partially an inflammatory milieu expressed via exosomes and their effects upon the immune system and other cells. The lecture wanders until 55 minutes when Dr. Ross explains how exosomes will be the standardized drug delivery vehicle of the future. This is an emerging area of clinical regenerative medicine. If you would like to know more, please contact me at drpark@rechargebiomedical.com to be put on an interest list. I will be offering “house calls” throughout the US and I look forward to offering this remarkable new modality, based on the body’s own healing, to you and those that you care about. As a retired physician I’d like to be informed more detailedly on exosome therapie(s) for academic reasons (meetings, videos, books etc.) for the time being.